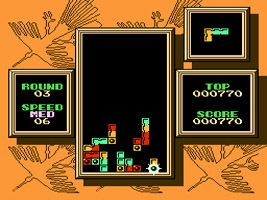 A sequel to Tetris that plays very differently to the original falling block game. You have three colours of falling blocks, and by lining up three blocks of the same colour, horizontally or vertically, they will disappear. While the falling blocks are still made up of four pieces, they may also be joined diagonally, creating many new shapes. Each stage begins with a set of Fixed Blocks, plus one Flash Block in each of the three colours. To clear each stage, you must clear all of the Flash Blocks, as they will cause all Fixed Blocks of the same colour to disappear. In this mode, you simply have to clear all of the Flash Blocks from each stage in order to move on to the next. You can set the speed and the round you want to start on. Essentially the same as Normal Mode, except it is possible to clear all of the Flash Blocks within the number of turns given to you at the start. You can play this mode against the computer or another person using the Game Boy Link Cable. Clearing the Flash Blocks or clearing chains of blocks will cause your opponent's ceiling to drop down, reducing the space they have, and making it easier to get a Game Over by preventing another block by falling.